Click on image to hear interview. Lutan Fyah speaks with Ireggae about his growing up around his granfather's Sound System and the influence it had on his musical career. Lutan talks about his initial audition for Gargamel, and how that led to his initial releases. 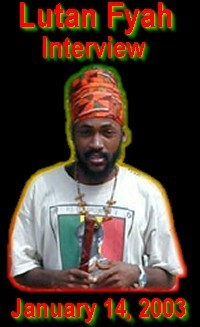 Lutan reasons about his debut performance in the United States along side Jah Mason at the 2001 Northwest Reggae Festival in Seattle. Lutan is currently in London working on a new album to be released by Jah Warrior. Lutan also discusses the recordings he has done in the Bay Area with the Higher Ground Sound label as well as his upcoming touring plans. He also states his feelings regarding the Queen of England's recent denial of reparations to Africans stolen out of their homeland by the United Kingdom. "Well rastafari livity to Lutan Fyah means to tolerate and live side-by-side with those of other faiths. No matter which race, no matter which class. The purpose of Haile Selassie is to see to it that we become one. In unity and love. And that is my purpose."